Have you ever experienced tripping over some loose cords and cables indoors or outdoors? Do your cables get damaged because of vehicle and pedestrian traffic? Are you tired of trying to organize and bundle huge amounts of cables into place? These problems should be least of the things that people get stressed with. 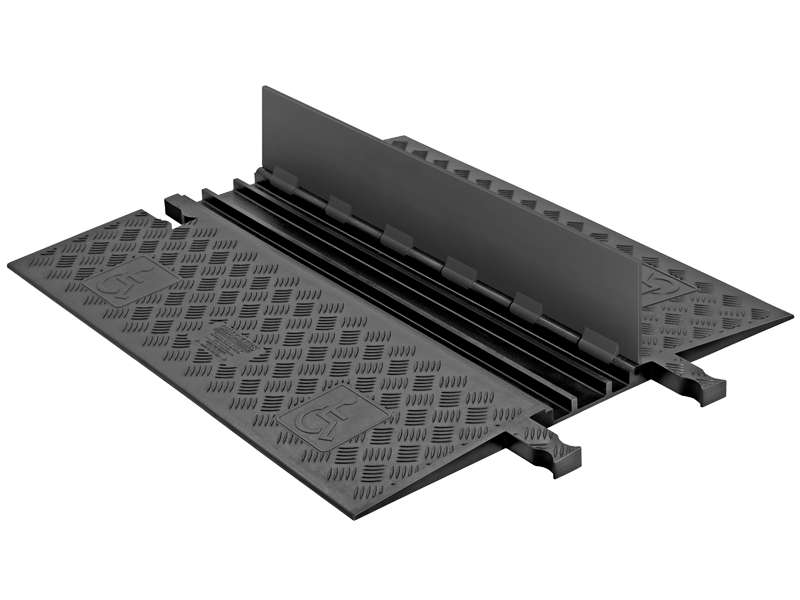 CableTiesAndMore introduces the Guard Dog Low Profile Cable Protectors with ADA Ramps that provide an effective and easier solution to cable management. The American Disability Act of 1990 prohibits discrimination against disabled individuals in public parks, schools, government buildings, etc. Exposed cables, cords and hoses especially in public areas can create a significant tripping and safety hazard for people on foot and disabled individuals on wheelchairs. Utilizing ADA guard dog cable protectors can extend the life of your precious cords and cables while ensuring safety and security for pedestrian traffic. 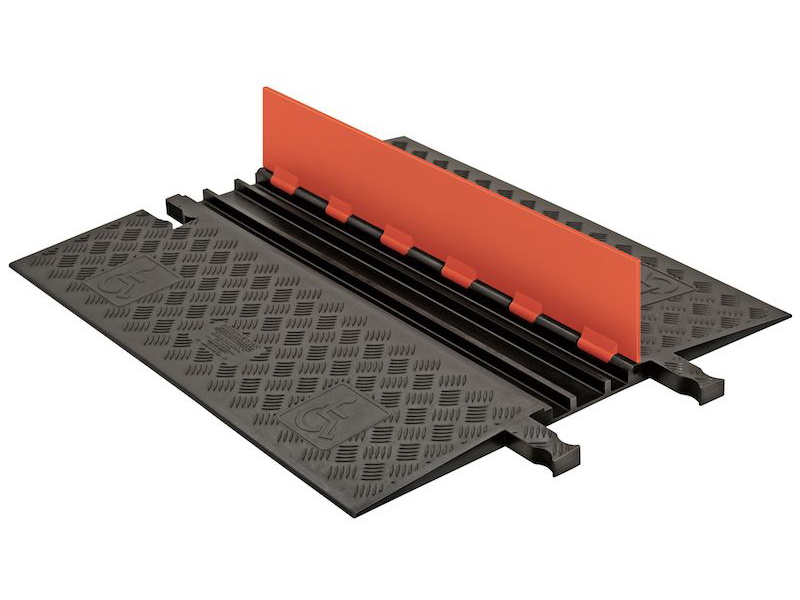 The ADA guard dog cable covers comply with the safety requirements of NEC, OSHA, RoHS, REACH and MUTCD. The cable protectors are made with durable and high quality material which is treated with UV stabilization and temperature resistant technology, making these products a one-time investment. 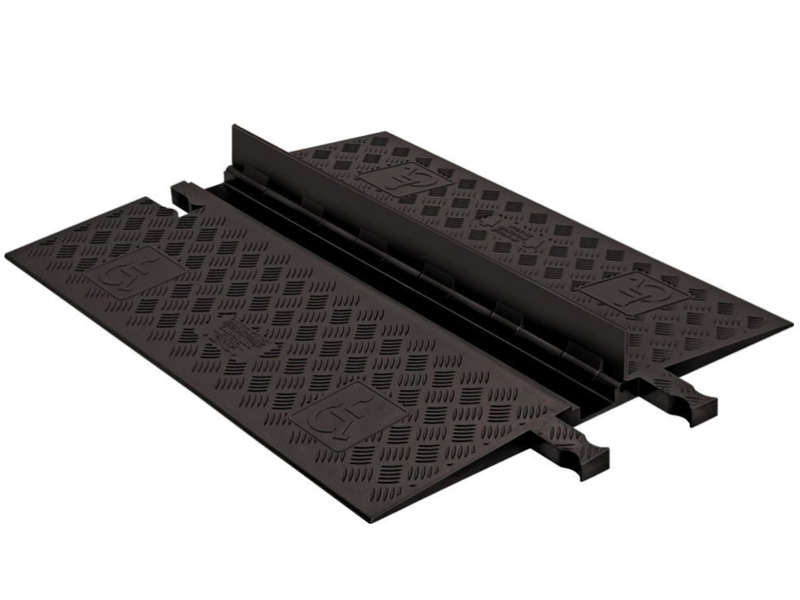 The low profile cable cover is manufactured using high-quality, durable polyurethane material which is non-biodegradable. The products are also temperature resistant – they remain unaffected even under extreme temperatures. The outside diameter measuring 0.75” protects the hoses, lines and cables from the inside and the outside. The cord and cable ramps are just 1.25" high which provides low profile protection and does not obstruct pedestrian activity or vehicles. 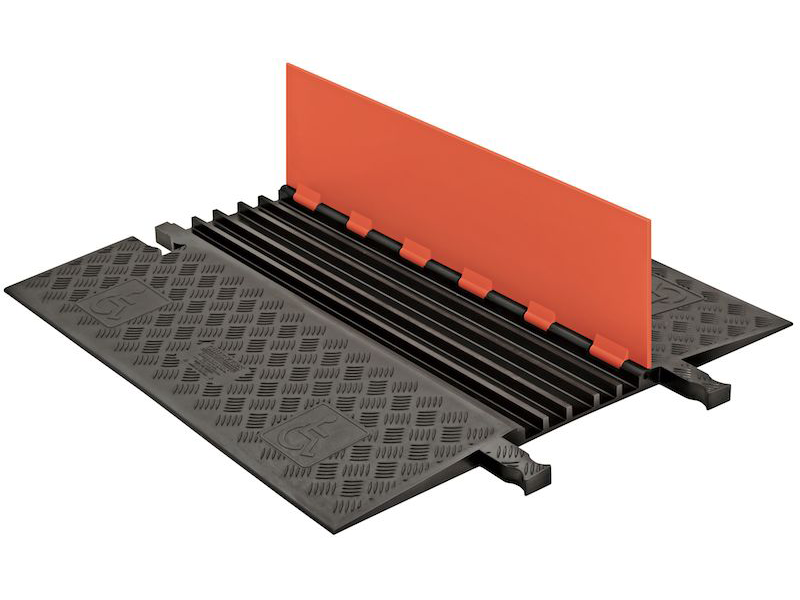 ADA guard dog cord covers are available in standard slopes or ADA compliant ramps which provide easy access to disabled or handicapped individuals. 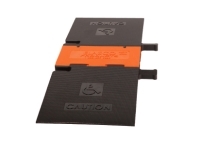 The low profile ADA guard dog cable protectors can be availed in two options for improved accessibility. 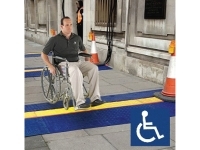 Low profile ADA guard dog cable covers come with side ramps, allowing anybody, regardless of whether in a wheel chair or on foot, to safely cross cabling while the standard low profile ramps are a moderate and simple solution for high pedestrian traffic areas. Safety caution signs can be mounted on the lid to highlight tripping hazards or dangerous cables. This helps pedestrians identify hazardous zones. 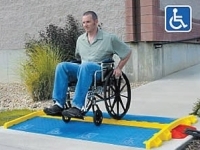 In compliance with ADA requirements, symbols are molded into every ramp to ensure that the products meet the required standards for handicapped people. 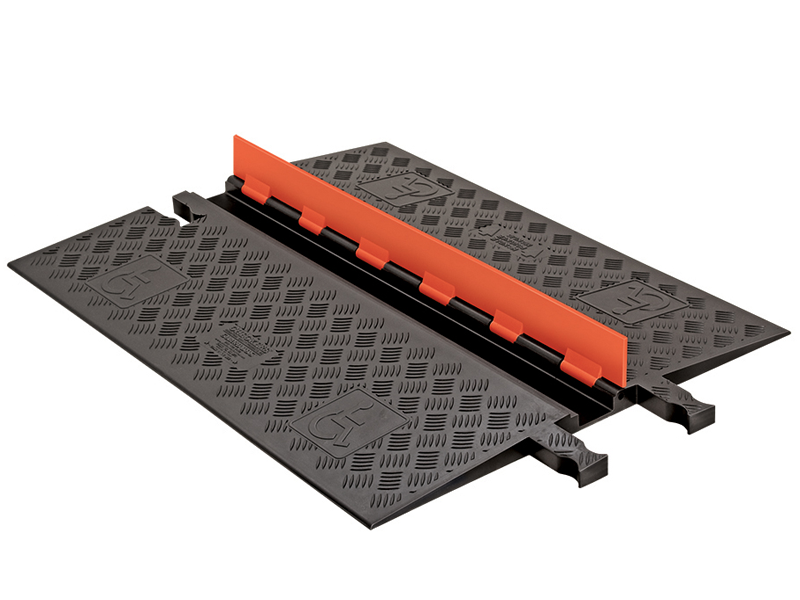 5-bar tread plate surface provides a safe surface for crossing. Solid pivoted cover for easily inserting or removing cables. These cable protectors have a high load limit of 36,000 lb. per tire or 72,000 lb. per axle. Can be availed with top quality dog-bone connectors. Solid Polyurethane manufacturing fulfills all federal safety requirements. Interlocking modular plan makes setup, breakdown, storage and transportation easier. ADA dog guard cord covers can be easily installed by a single person. 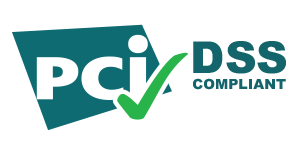 The ADA product range meets NEC article 525 safety requirements. The ADA product range meets all requirements set by the Americans with Disabilities Act for increasing the quality of life for disabled individuals. 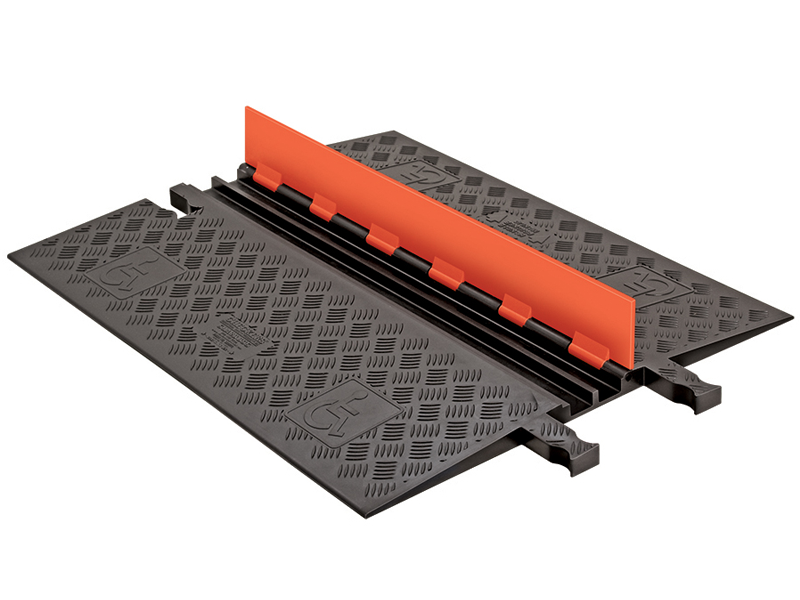 The ADA guard dog cable covers can secure cables and hoses up to 0.75″ outside diameter. Cable covers can be extended with other ADA/DDA Accessibility Ramps. The ADA product range has a licensed 5-bar tread surface for increased safety and security of pedestrian and vehicular traffic. ADA guard dog cable covers are not provided with end caps. Hence they should be secured with separate connecting ends. Insert one cable at a time in the channels. Do not overload the channels with more than the recommended number of cables. After inserting all cables, secure the lid with grip tape.